Increasingly, productivity is moving away from the classic desktop machine. Desktop-based, bulletpoint-heavy presentation software can feel like it’s stuck in the last century, and the range of online presentation tools is growing all the time. When tools that will let you make simple presentations on your iPad, allow you to build presentations out of any combinations of media or let you build your presentation as a fun, approachable cartoon, you’re going to look pretty out of place up there with your laser pointer and your bullet points. Yes, PowerPoint retains its market dominance for now, but it’s hard to see how it can compete without adapting, faced with the competition here. 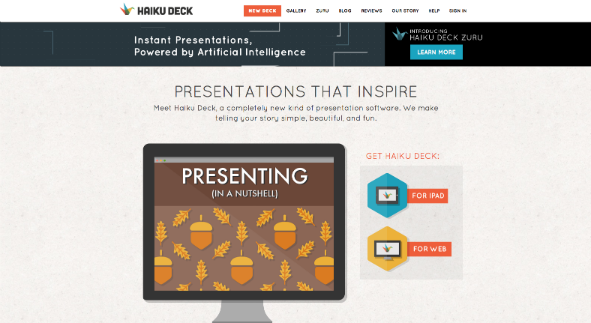 The iOS and web apps are ‘and will always be’ free, but subscribers to HaikuDeck’s Zuru service pay $60 a year. SlideDog is more freeform than HaikuDeck. It lets users effortlessly combine media from multiple sources into a single presentation, which suits it for conveying complex ideas or for making a presentation more dynamic and fun. The biggest perk is the simplest: everything shows up in your presentation the way it looked to begin with, with no file type or compatibility issues. It’s also possible to use SlideDog for online presentations shared via web browser, and the tool incorporates unique interactivity, allowing polls, feedback and more to be built into online presentations. While SlideDog was designed as an online presentation tool, it also works offline as long as online elements like Youtube videos aren’t added to presentations. SlideDog is free to use and the free plan even supports brief trials of premium features. For the most control and interactivity, though, you’ll have to go pro at $8.33 a month. 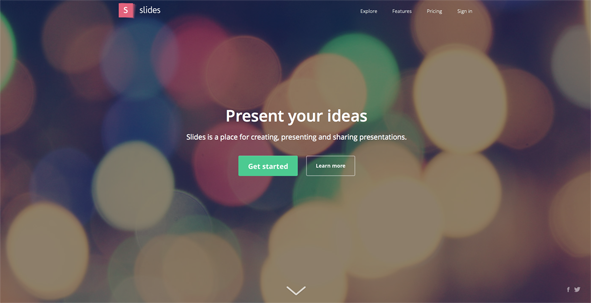 Slides is a browser-based presentation editor with free cloud storage. It focuses on appearance more than storytelling, so if you’re the kind of person who normally uses three PowerPoint slides but gets annoyed at how dull they look, Slides could be for you. Slides presentations are referred to as ‘desks,’ and these are cloud-based, though they can be downloaded – as well as embedded. Slides is free if you don’t mind all your decks being public. If you want privacy, you’ll have to pay, starting at $6.00 a month for an individual and rising to $12.00 for a team. 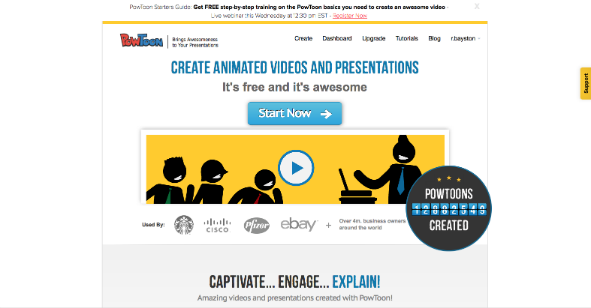 PowToon is designed to create animated presentations and videos. It’s more focussed on what the company calls an ‘explainer’ style of presentation, offering a fundamentally different attitude from most other presentation applications, which is why it made the list. PowToon uses slides for storyboarding and managing, but its presentations are like short films. Yes, the core app sacrifices the extreme clarity of a list of bulletpoints projected behind you, but they gain in watchability, with animated characters and voiceovers. And if you want bulletpoints, there’s PowToon Slides. PowToon integrates seamlessly with Google Slides too. Freemium, basically. From a panel that looks a lot like WordPress’ themes options, you can select ‘upgrade’ and get Pro for $19.00 a month or Business for $57.00 a month, and since the basic membership features outros, watermarks and limited graphical options, most users probably will. 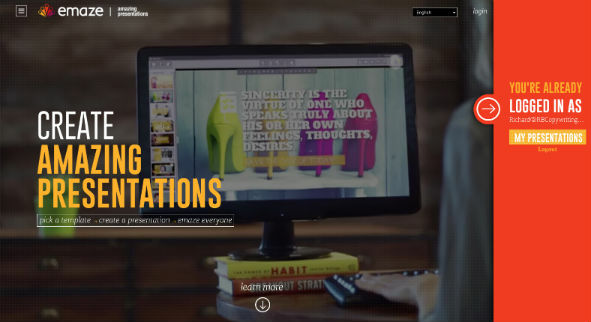 Emaze offers a themes-based approach to quickly creating attractive presentations, with 34 themes to choose from and variations within each theme. That’s still a lot less freeform than many of the other contenders on this list. Cool features include an inbuilt translation tool and Emaze comes with multidevice compatibility. It’s cloud-based, and presentations are downloadable. Emaze can be free but most users will select from three subscription plans, Pro at $4.89 a month, Emazing at $13.25 a month or Business at $14.91 a month. Visme.co, where you can create infographics and other content as well as presentations; Zoho Docs, an online productivity suite including a document and spreadsheet function as well as presentations; and Google Slides, which is reliable and highly available even if it is a little pedestrian. Did we miss your favorite online presentation software? Or do you want to give props to one of our selections? If you think we’ve really hit the nail on the head, or you’ve got a bone to pick with us, get hold of us in the comments section below.